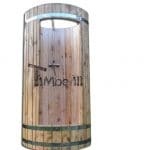 Outdoor Garden Barrel Saunas for Sale in the UK! DIY Outdoor Saunas! Now offering assembly on-site services for flat-packed sauna models as well! Purchase an outdoor sauna – High quality, low price! You would like to purchase a sauna? Or perhaps you are playing with the idea to order an outdoor sauna with a wood stove? Then you are exactly in the right place. TimberIN is one of the most renowned manufacturers and suppliers in Europe. For almost ten years now, we have been supplying our customers in all of Europe. 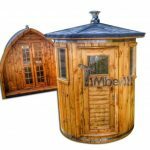 Whether you want to buy a barrel sauna with a wood stove or an Igloo type sauna with an electric stove, in our wide assortment you are guaranteed to find something you’re looking for! And if you have found a product you like, there are various reviews of the products available on our website. If you have any questions, requests or suggestions, please do not hesitate to contact the TimberIN team. As the name suggests, the look of barrel sauna resembled that of a wine barrel. 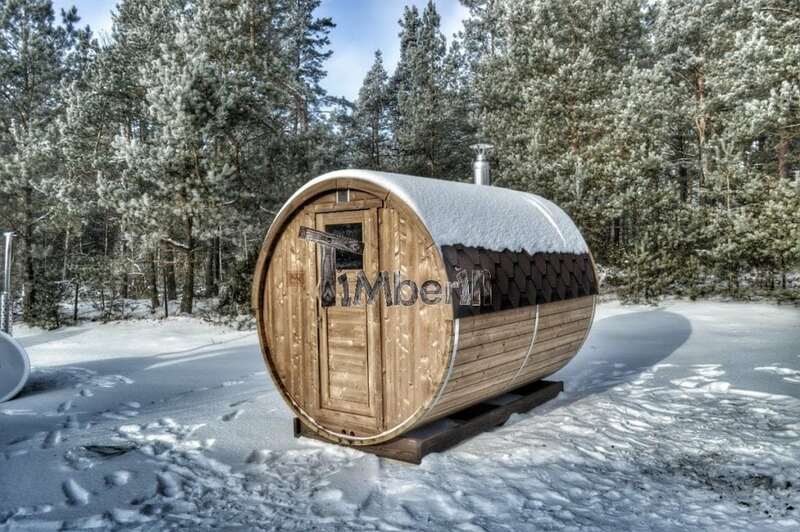 A barrel sauna provides the necessary idyll and creates a relaxed atmosphere. 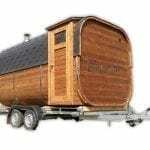 Of course, the barrel sauna is available in different sizes and configurations. You yourself can determine the equipment of the sauna. No matter what additional requests you have, we will consider you in the production to the best extent possible. Both saunas have the advantage that they require little space and visually are a perfect complement to the garden. Whether as a rustic element or an ancient counterpart to the modern property: If you buy an outdoor sauna, opt for a visual highlight. In our wide assortment, you will find many variations regarding the configurations of the outdoor sauna. A popular idea is, for example, the barrel sauna with wood stove. An ideal combination! In general, a sauna with a wood stove is a great idea if you value sustainability and romance. 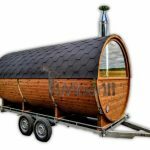 An outdoor sauna compared to the barrel sauna has the advantage that in terms of size more options are available. An outdoor sauna is often a small hut, which is built with an extra foundation. An outdoor sauna with a wood stove is ideal for spending relaxing hours in nature and treating the body to a well-deserved relaxation. Warmth on the skin, pleasant smells, calm – what more could you want? In the production of the outdoor sauna great importance is given to natural products. After all, most of our customers are as great nature lovers as we are. Not infrequently, the outdoor sauna is called a sauna house. The term is not completely outlandish if you decide to build a larger hut. Of course, a larger sauna means more comfort and space as well as other possibilities to decorate the sauna house accordingly. Some examples of individual facilities and unique configurations can be found in pictures and reports of former clients on our website. There are (almost) no limits to your imagination! We look forward to assisting you, if you want to buy an outdoor sauna! It will probably not be a coincidence that our customer base extends to more than the UK area and we are constantly gaining new customers. We are proud to have developed such a position in the market all in about seven years. To continue to pursue this goal, we strive to maintain our recipe for success and keep our finger on the pulse of the market. If you want to buy a sauna with wood stove, we are – and will continue to be – the best supplier around. In our sauna shop, you will find all sorts of designs in one place. Whether timeless classic, modern or rustically ancient – we carry all models. 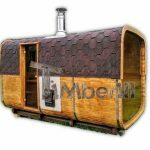 On request, we can even produce the outdoor sauna, the sauna barrel and other according to your individual wishes. Customer satisfaction is our top priority together with nature conservation! We at TimerIN are always working to make the order as uncomplicated as possible for our customers. For this, we take into account all comments made by customers in the context of the order. As a result, ordering an outdoor sauna is completely uncomplicated. Should you have any problems with ordering a sauna, you can reach us in various ways. Whether you write us an email or call us – we are always happy to help you. Another way of making the connection between customer and supplier as close as possible is valuation. On our website, you will find various reviews of the numerous products. Here the buyers have listed their experiences with the respective product. These reports are perfect for undecided buyers! In the respective reports, the customers also give tips on what they could have done better. Tips that help you to buy your sauna. By being able to write and share reviews, we take account of transparency, which is an essential element for us. TimberIN has built up a large customer base from all over Europe. 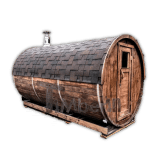 If you want to buy an outdoor sauna and get advice from a friend who owns a barrel sauna, it is quite possible that his sauna is one of ours. If you do not know anyone who owns one of our products, we will gladly arrange a contact point from one of our former buyers. Some customers have agreed to be available for questions from potential buyers. Therefore, you have the opportunity, before buying a sauna with a wood stove, to get reviews and recommendations. With TimberIN you have a competent partner at your side who considers the welfare of nature and customer satisfaction as top priorities. Only thanks to a healthy combination of all goals can we succeed in remaining what we are currently: one of the largest sauna manufacturers in Europe. In Scandinavia, outdoor saunas and wood fired hot tubs are common. An outdoor sauna is a perfect solution to relax, cleanse the body and soothe the mind. It’s the perfect retreat from the fast pace of modern life and best of all – it doesn’t take up any room in your home. 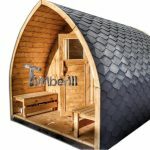 Seeing all available sauna designs above, let’s discuss their main construction parts. A shower together with a garden sauna or an outdoor hot tub is quite a popular choice. The shower can be positioned either inside or outside as a separate unit of the outdoor sauna. If one opts for a shower inside the garden sauna, then normally it is installed in the entrance area which is separated from the main sauna`s room. It is important to foresee the water drainage together with a shower. Water should not be kept on the ground to avoid fast wood deterioration. The more popular choice is the external wooden shower. The main thing to consider when choosing the outdoor saunas or barrel saunas is the heating source. The most popular are wood-fired Harvia stoves. Simplicity and style are the factors making them so popular. If the fumes are not allowed in your area, you could consider electric Harvia heaters as well. The constructions are simpler since electric barrel saunas don’t have the chimneys and other sophisticated roof`s waterproofing parts. The main difference between electric and wood fired Harvia heaters is the power measurement. The power of an electric heater is described as kW. The kilowatt (kW) is equal to one thousand watts. This unit is typically used to express the output power of engines and the power of electric motors, tools, machines, and heaters. It is important to know how one calculates the costs of running the electric garden sauna. Each electric heater has its own power consumption level. One must pay attention to how many kW does the heater have. Normally they come from 3 kW to more than 10 kW depending on the model. Let’s take 6 kW as an example. If you have been to the outdoor sauna – barrel sauna for 3 hours running the heater on maximum power, you end up consuming 18 kW of electricity (6 kW * 3 hours = 18 kW/h). Next step is to check your local electricity bills. Let’s say one is charged 0,2 EUR per kW/h, so the total price would be only 3,6 EUR. All electric heaters used to heat the garden saunas or barrel saunas are equipped with the thermostat so one is easily able to reach the required temperature and adjust it. The power supply which is needed depends on the power of the electric heaters. Units with up to 6 kW can be powered by a single phase 220 – 230 V cable line. More powerful ones are supplied by 3 phase 380 V cable. Wood-fired outdoor garden saunas can be completely off the grid. One doesn’t need any electrical supply to power them up. The drawback is that you can’t adjust the temperature with such ease as in the electric outdoor sauna. 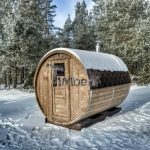 So how can we adjust the temperature inside the barrel sauna and how can we describe the power of the wood burning sauna heater? Well, wood burning sauna heaters don’t have such indicator describing the power levels as electric ones do. While the electric ones are described by kW, the wood burning heaters are classified by the size and the number of stones that burner can contain. Stones act as heat accumulators and as more stones there are, the more heat will be spread across the sauna. The temperature of the wood-burning outdoor sauna can be set only by the amount of wood that one puts in the heater`s hatch. If there is too much of heat inside, one can always open the windows or doors to make proper ventilation. Wood fired heaters can be equipped with internal or external hatches (the place where you put wood). The external hatch is a perfect way to load wood without interfering with people inside. This is particularly useful for hotels or bed & breakfast to serve their clients. We also offer a big variety of hot tub heaters. Changing rooms in outdoor saunas are quite a common choice. It is nice to have some spare place to leave your clothes before entering the sauna. The size may vary from 1 m to approximately 2 m. In order to better understand the construction, we give the example. Say, you select the sauna which is 4 m long having 1.5 m of changing room. 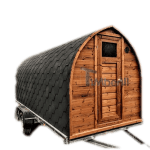 This type of garden sauna would be ideal for 4-5 persons since the main sauna`s area is 2.5 m long and the remaining 1.5 m is the changing room. The changing room is separated from the main sauna room with wooden or glass doors. If there is only a small space available in your garden, one can give up a changing room and have the full-size main sauna room. Optionally, the changing room, as well as the main sauna area, can be illuminated by some LED lights built in under the benches. Changing rooms of the outdoor saunas and barrel saunas are built from the same wood and require no additional or different materials. If you do have sufficient space in your garden, we always advise having the changing room inside the barrel sauna. It is much more convenient. The porch is another great addition to your wooden sauna. It is very comfortable to avoid instant wind or just calmly sit after a great sauna session. The length of a porch may vary but the most popular choice is 1 m. So again, having a sauna with a total length of 4 m including 1 m porch, you are left with 3 m main sauna area. Porches of the garden saunas are usually built with side benches and covered with the roof. When it comes to the question of how many people would one or another garden sauna hold, it is not very easy to answer. It very much depends on the size of the person but in this case, let’s take an average-sized 175 cm tall weighing approx. 80 kg person. 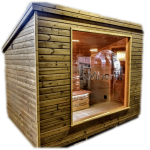 The 2 m long garden sauna would comfortably fit 2 persons, 3 m – would fit 4 persons and 4 m long outdoor sauna would sit 6 or more persons. The type of garden sauna whether it is barrel or iglu does not influence the number of people comfortably sitting inside. On the other hand, the rectangular sauna of the same length fits more people since the walls are straight. 2, 4 person saunas are the most popular choice for small families, while 4 or more meters saunas are usually being chosen by hotels or various bed & breakfast facilities. When building an outdoor sauna in your garden, it’s important to pick the right place. You want a space that is relaxing and somewhat secluded. After all, you don’t want your neighbours catching a peek at you in your sauna! Make sure the space you choose is large enough to comfortably house the room and is far enough away from your home to not pose a hazard. You may or may not need a permit to build your sauna depending on where you live. Essentially, any site that is suitable for a shed will also be suitable for a sauna. In the event that the ground cannot be levelled, your sauna can be raised using blocks or a small foundation. Some designs allow you to partially bury the base of the sauna, giving greater freedom for placing it. Basically, each sauna comes with an already pre-built wooden foundation that means you only need to level the surface and ensure the proper ventilation under it. Surely, the sauna can be seated on a wooden terrace or some kind of patio. The material is not much important. Each sauna has its own foundation measurements that your ground construction should meet in order to nicely position it. There are plenty of outdoor saunas for sale on the internet. Consider your space, your goals, and your personal preferences when making a decision. Wooden garden saunas should be made of a durable timber that has been treated to withstand heat and moisture. Some designs, like Igloo or barrel saunas, will have other special considerations to take into account, so before you order, make sure you can accommodate the sauna you choose. Once your outdoor sauna is installed, you can begin relaxing and leading a more enjoyable, health-centred life. Your sauna is sure to become your favourite feature of your home, giving you years of trouble-free enjoyment. Order your sauna today and see why so many Scandinavians have already built their own little havens in the comfort of their gardens. 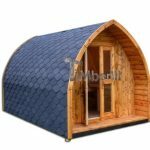 Outdoor saunas or camping glamping pods are also an excellent addition to the outside of a house. Do it yourself (DIY) outdoor saunas are available that can be built by the homeowners themselves. The space per person depends on the number of people the outdoor sauna is supposed to seat. An outdoor sauna is an excellent relaxation facility that can easily increase the worth of your real estate. The outdoor sauna is a go-to relaxer for most people who have realized its advantages. It even helps in reducing weight and clearing out the bodies toxins.